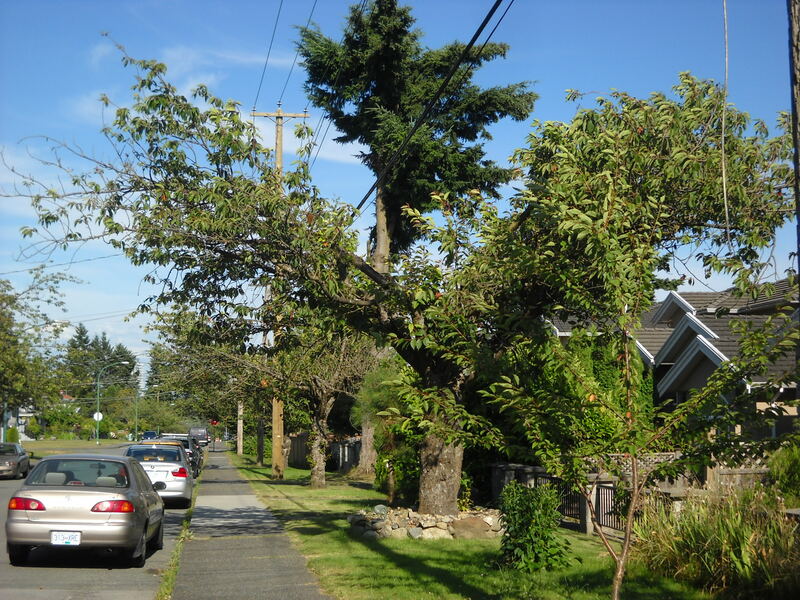 I’ve been driving through Richmond BC lately and have been struck by how many disastrously pruned trees there are. 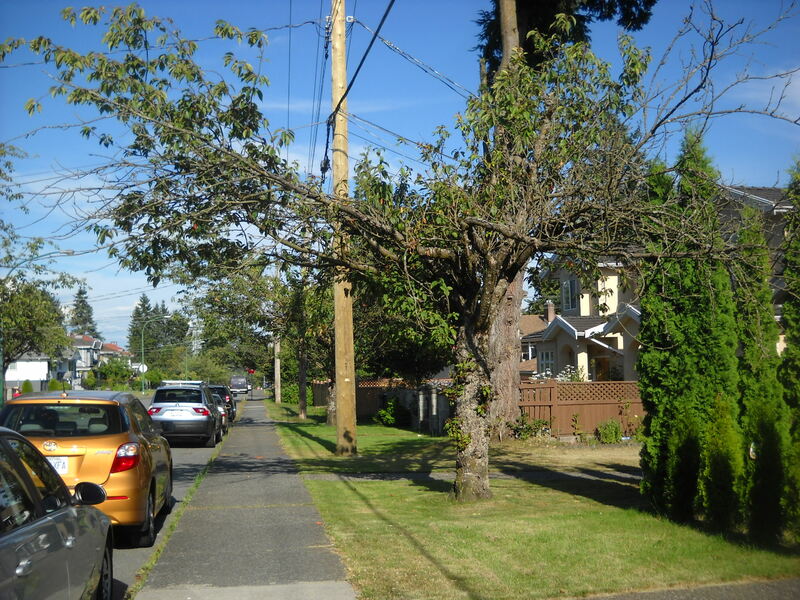 Most of them are pruned the way they are because they are interfering with utility lines/poles in some way. 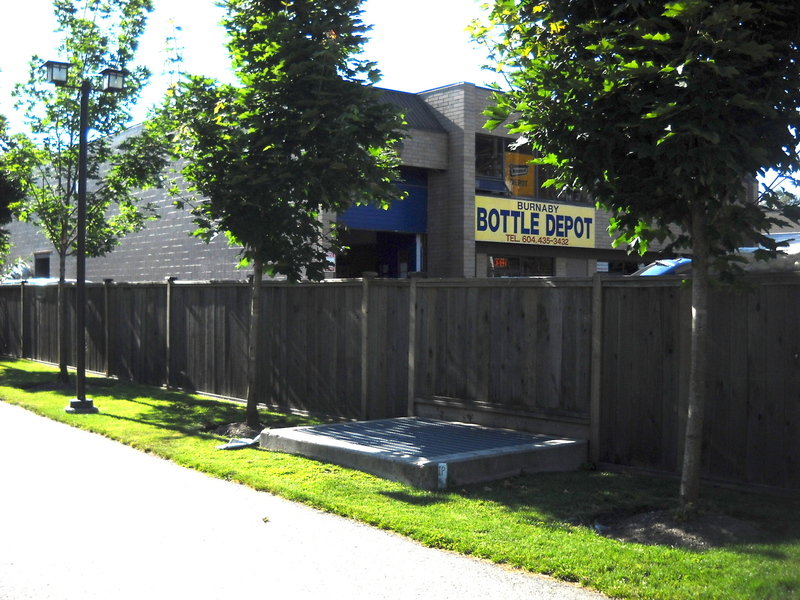 So this post is a primer on how NOT to design with trees. You can see, right to the trunk! This is “my” tree–ie, on my property. But BC Hydro doesn’t really care whose tree it is, if they think it’s interfering with their lines (why don’t we have underground lines?? ), they chop chop chop. 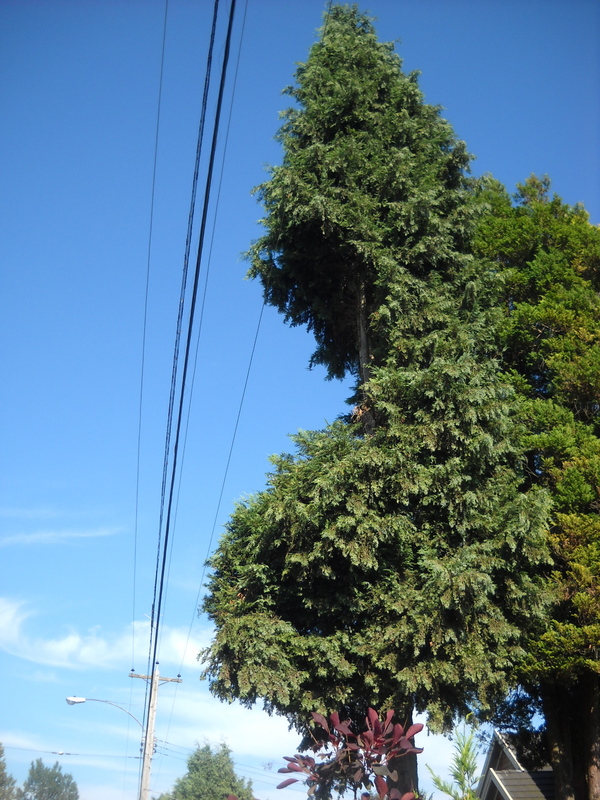 And the “arborists” who did the work… arggghhh! A maple, probably a sugar maple. 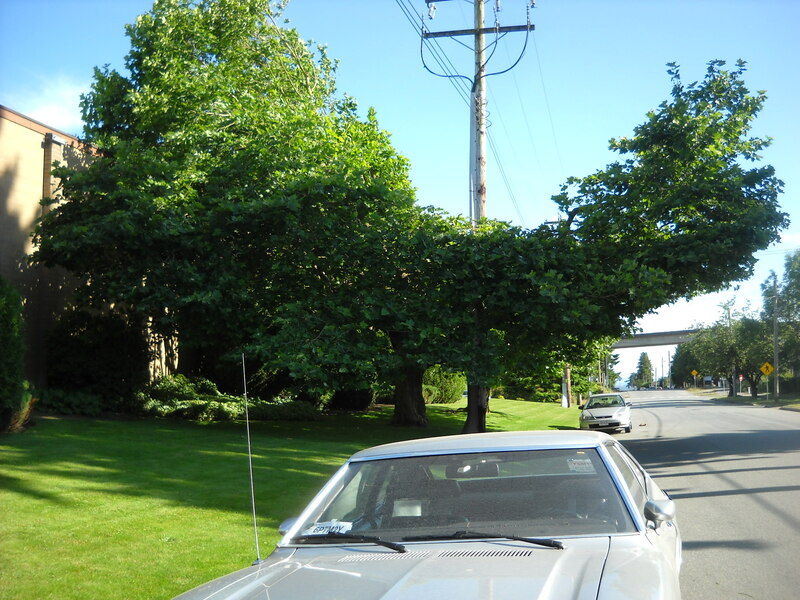 You can gauge the size of it by looking at the car toward the back, just outside the tree’s shadow. And yes, that is the same tree growing way above the top of the building. 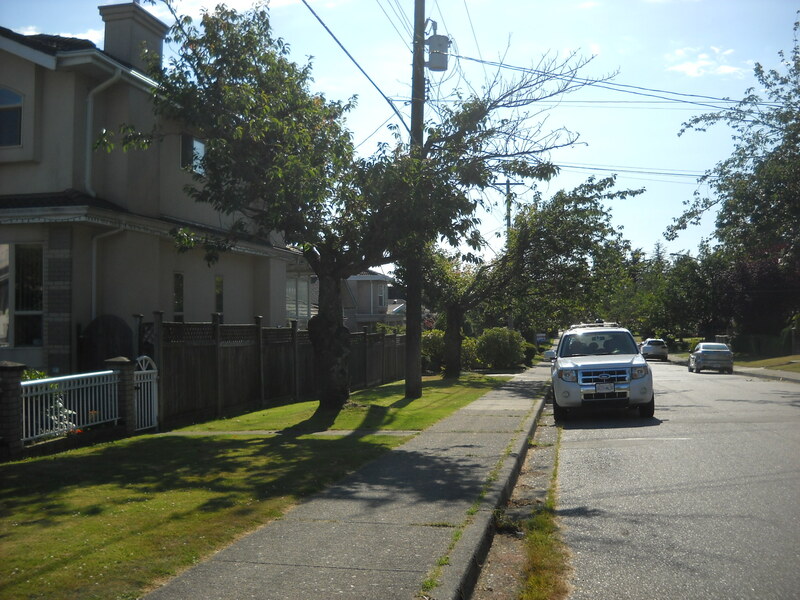 Cherry trees–two blocks over from my street. Here’s a double whammy– same block as previous picture. This one doesn’t have much life left in it. Click on it for a larger view. So my point with all these disasters? CHOOSE YOUR SPOT. 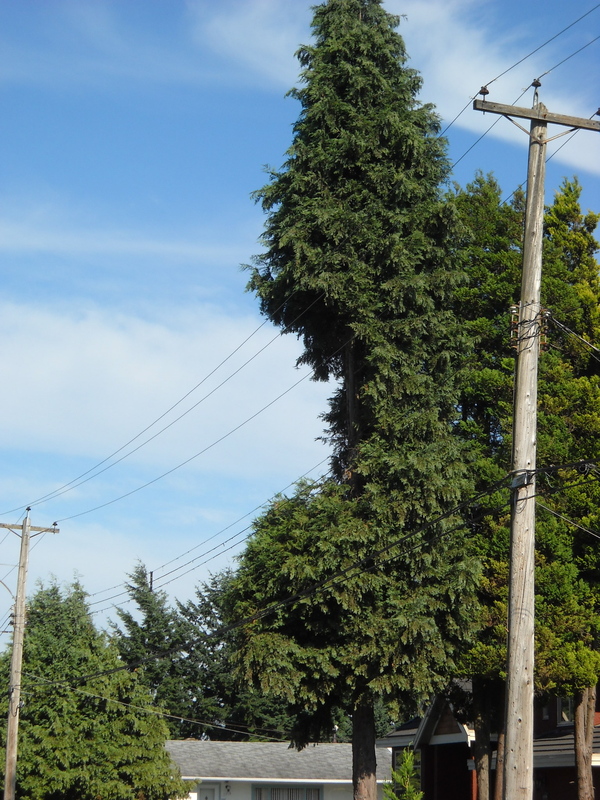 Big trees will grow big, and the utility lines don’t, so make sure your tree at maturity will be safe from the utility company. How long before this spruce (or is it a fir?) succumbs to the chain saw? 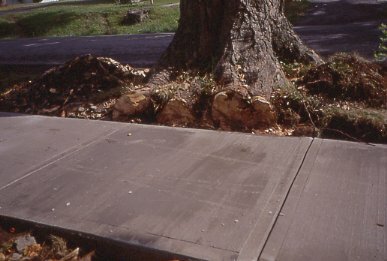 Maple trees have large vigorous roots that don’t do well near sidewalks. This is a stock photo, not my neighbourhood. So again, big trees need big space. Before buying your tree, read the label, determine if there’s room in your garden for the mature size of this tree, and if not, please buy something else. Still in my neighbourhood. Admirably trying to hide the … whatever it is. 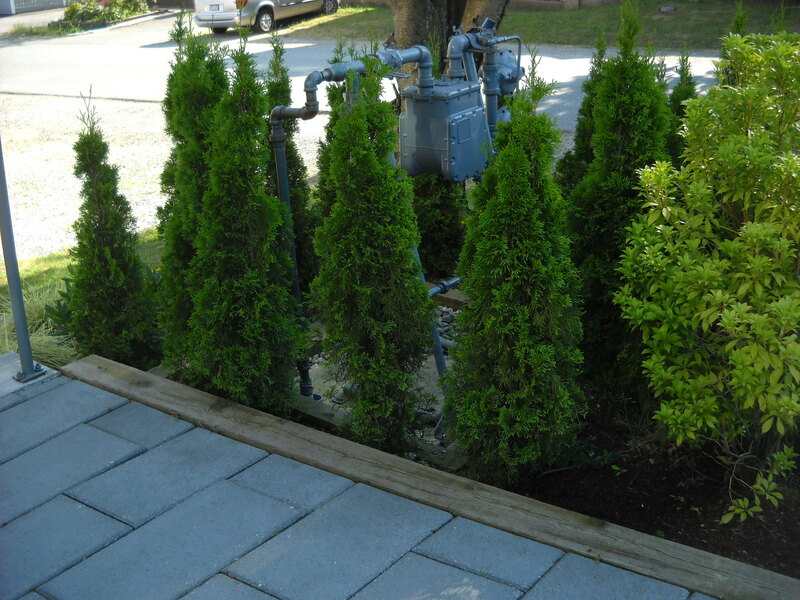 These lovely Thujas (or Arborvitae) are all planted about 16″ apart. The mature size of even the smallest, narrowest Thujas is about 3′ (which I found out by Googling “mature size of Thuja”– remember, Google is your friend!) This is going to result in not only a lot of pruning, but quite a lot of dieback, as new growth keeps getting cut off. 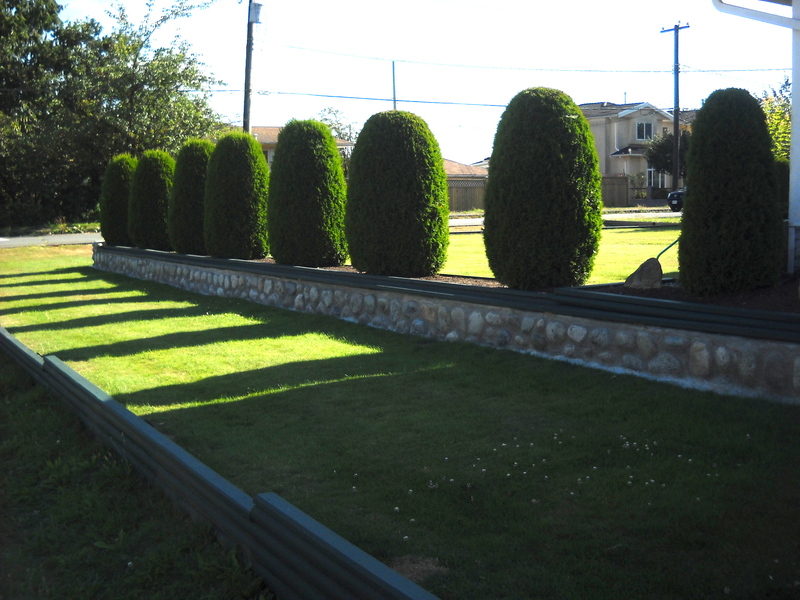 Even shrubs that tolerate a lot of pruning, like Boxwood, should still be planted with their natural mature size in mind. 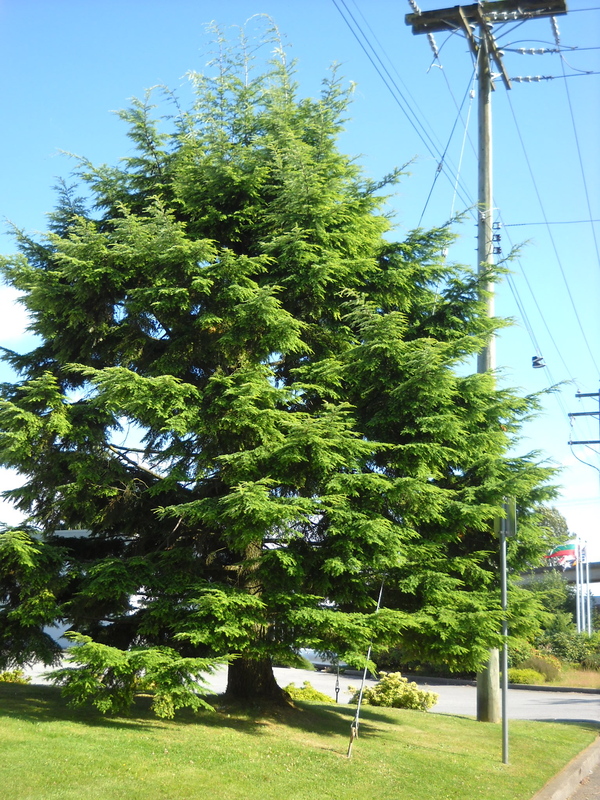 Now I confess, this is not my preferred pruning style for Thuja, but look how healthy they are, spaced widely enough that they all get lots of light and air. Trees are a wonderful investment, and a significant one as well, being not inexpensive. Do the best for your tree and your investment, make sure you’ve read the label, talked with the garden centre, and looked around to see a mature specimen of your chosen species before you buy. There are so many beautiful trees out there, certainly one perfectly suited to your unique environment. This can be unnecessarily complex: there are USDA Plant Hardiness Zones which includes Canada, and bases hardiness zones on average minimum winter temperatures; Plant Hardiness Zones of Canada, which also uses average minimum winter temperatures but is different from the USDA zones; and Sunset Zones, which are much more comprehensive, using average warm and cold temperatures, humidity, length of growing season, and other factors, but which unfortunately is seldom used on plant labels or any other resource. 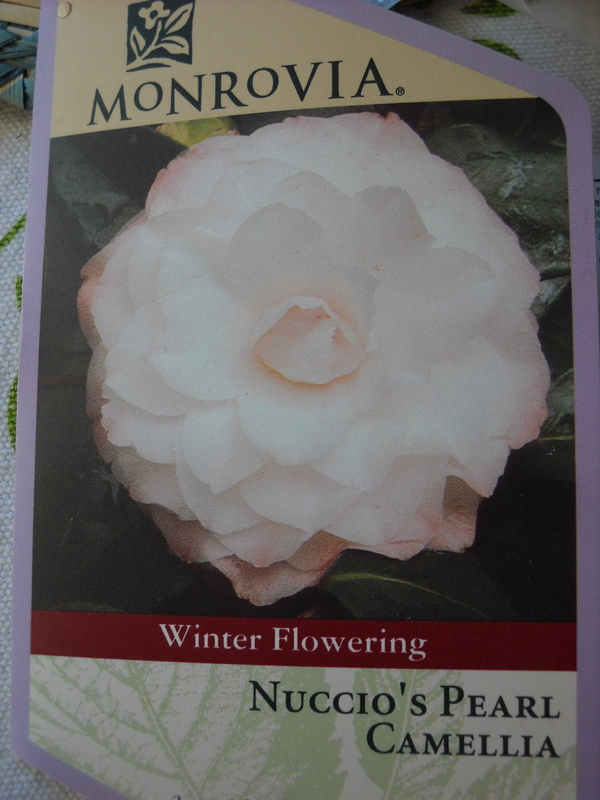 Most plant labels, even plants that are sourced in Canada, will use the USDA zones, so let’s go with those. Here in coastal BC most of us are in Zones 7b (slightly less cold than 7) to 9a. So bottom line here is that plants that are “hardy to zone 10” will generally die in average Metro Vancouver winters, and therefore are what we generally call “annuals”. But “hardy to zone 8” means we’re fine. 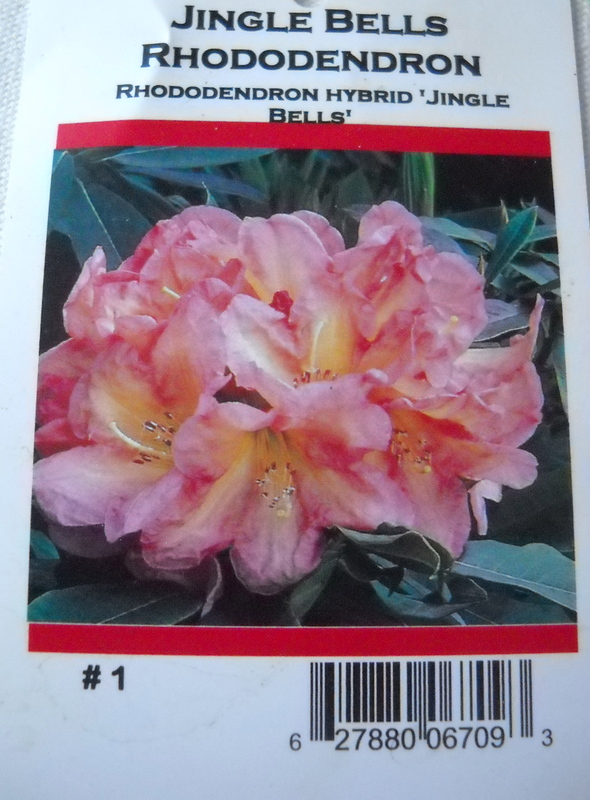 This is the label to Rhodo ‘Jingle Bells’, Zone 7. The above label says the “average size” of R. ‘Jingle Bells’ (implying “mature size”) is 3′ tall and 4′ wide. 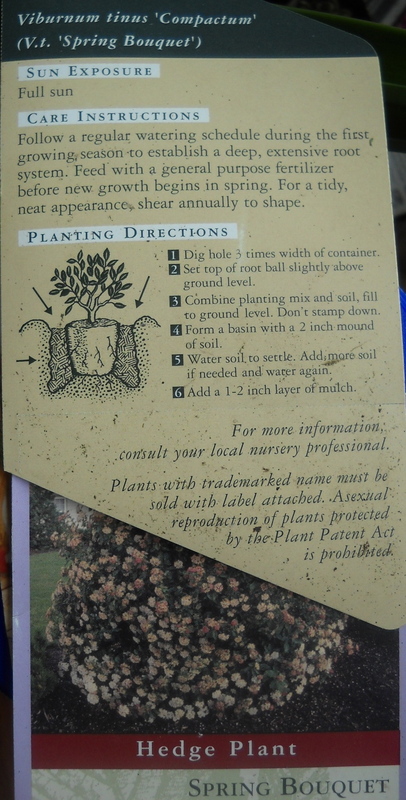 When you’re planting say two of these, the distance between the trunks of the two should be at least 4′. If you plant it next to something that grows to 6′ wide, you’ll want to have 5′ (radius of one plus the radius of the other) between the two trunks. Knowing its mature height allows you to determine if you can plant something nearby that will look good towering above it, or if it would comfortably shelter something growing underneath it. Note the “Average Landscape size”. CLICK on the picture if it’s too small. “Slow growing to 6 to 8 ft. tall and wide, larger with age“. So if it doesn’t grow older, it won’t grow bigger. I’ve planted it in front of Rhododendron ‘Johnny Bender’, hoping that JB will grow bigger than the label says (5′ T and W) and that NP will NOT “grow larger with age”. A quick primer on Sun/Shade Exposure, starting with: spend a few days in various seasons watching where the sun hits the ground in your many garden areas. Part Sun or Part Shade or Dappled Sun or Light Shade: 4-6 hours of direct sun, maybe divided into early morning and later afternoon, or all early morning, or all later afternoon, or right across the hottest part of the day. Full shade: At the most 1-2 hours of direct sun. But if your full shade has lots of full sun nearby, it’s still pretty light, and might support lots of “light shade” kinds of plants. North-facing front yard. House casts full shade on the rhodos, but the rest of the yard is in full sun all day. The shade is bright shade even tho’ it gets no direct sun. And even tho’ in this picture it looks like NIGHT. 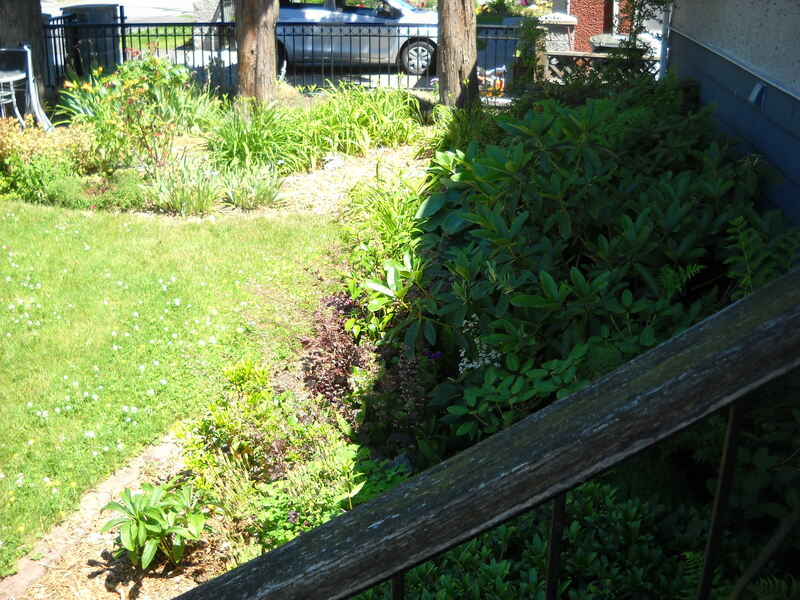 Dense Shade: not only no or minimal direct sunlight, but lots of dense things hiding sun: like your own building and a highrise 20 feet away, and a 50′ cedar over to the right, and a maple to the left. That’s DENSE shade. “South Facing” or “North facing” or whatever doesn’t always mean much. My “North facing” front yard is actually in full sun from 8 am until 8 pm. (in the summer), while my “South facing ” backyard has lots of areas that have no direct sun ever. 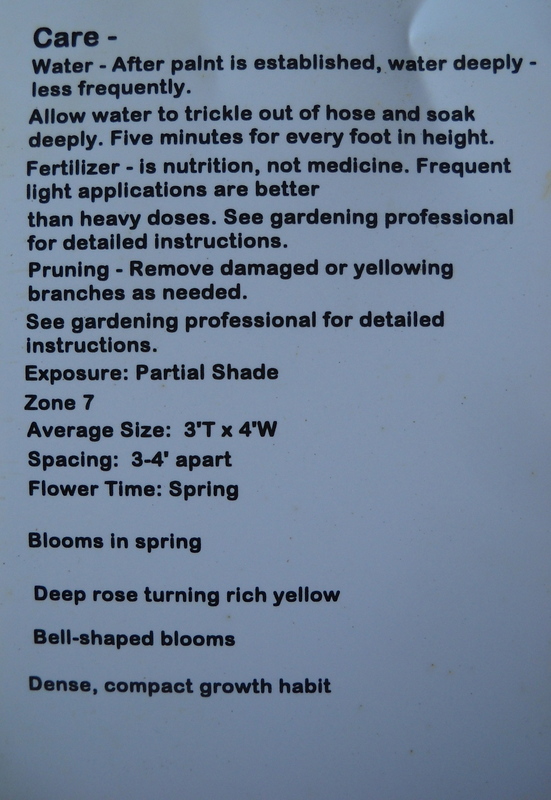 Almost every plant tag will recommend “fertile” soil. 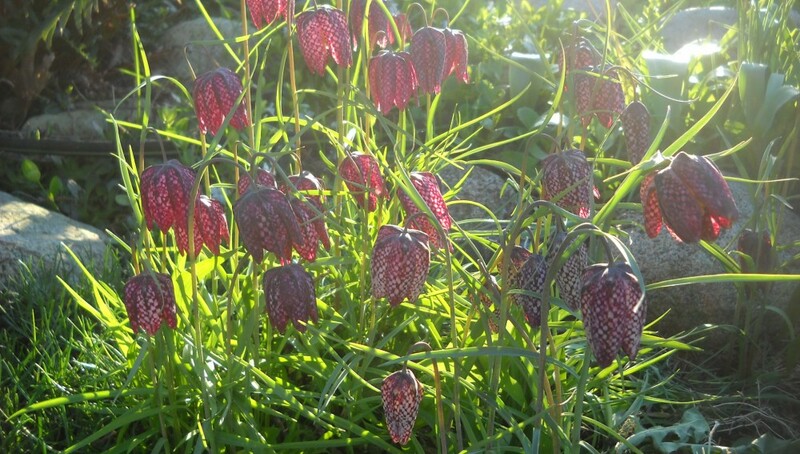 (There are a few plants that actually prefer poor soil, but that’s for another day…). 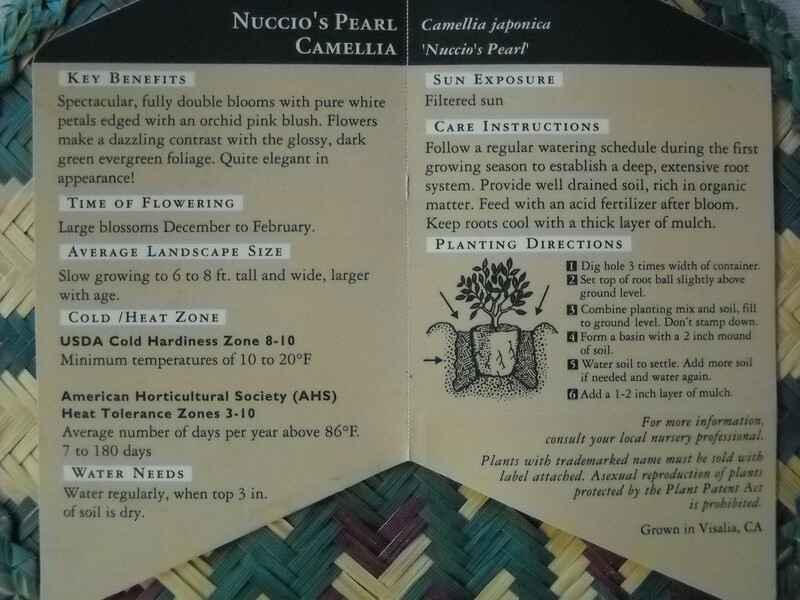 So let’s assume you have decent topsoil and a little organic matter (compost, sesasoil, mushroom manure…) added. Once you have soil that will support decent plant growth, you should place together plants that have similar watering needs. For example, many sedges are the kind of plants that grow along river and lake edges, so should be in really moist soil. Don’t plant them in raised beds that will dry out quickly (unless everything in that bed needs to be in really moist soil). Lady’s mantle (Alchemilla) and salvia are very happy in drought conditions (after giving them a few months to grow deep roots). So plant them together and don’t water them like the sedges. Good plant tags will include watering instructions, but they don’t take into consideration what else might be going on in your garden–which of course the growers can’t do! Most plants need excellent watering their first year after transplantation (from the grower’s environment to your environment). After that they should only receive the amount of water they would need in their native climate. Many plants won’t need any extra watering above what we get in an average growing season. Best practice: grow plants together that have similar food and water needs. There’s so much more to say on all these subjects, so if you have questions, do post them and I’ll either give you answers or direct you to answers. As always, look forward to your comments; click on the follow button to get regular posts fro RLGS.